Looking for a great sportsbook that offers the best free bets and promotions? We have looked at all the best free bets and promotions available and reviewed each sportsbook with a focus on user experience, betting products and their odds competitiveness. Despite having .eu in their domain name, Bookmaker is a great option for US-based bettors. First of all, they are one of the oldest betting companies in the world, founded in 1985. Their first website came online in 1996 and today they are one of the top betting providers in the US. In this review we will tell you everything you need to know about Bookmaker sportsbook. 5Dimes has been in the business since 1998 and they are one of the sportsbooks with the longest tradition in the US. As a well-known operator, 5Dimes doesn’t have to offer an amazing welcome bonus to draw potential customers in, so they rely on consistent odds and betting limits to keep their position on the market. In this review we will cover all the positive and negative sides of 5Dimes and give our readers the complete guide of this particular sportsbook. Bet Online has been in the business for more than 10 years. They are a company based in Panama, an international bookmaker, among the biggest 50 in the world. 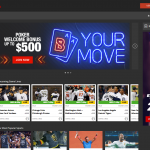 Bet Online sportsbook is well-known to US-based bettors and in this review we will cover all the major aspects and advantages of this particular operator.